Carmen Duffek and Jerry Gaer scored 1.78 masterpoints with a 56.38% game at In Tempo Bridge Club. See full results of this game. Sandy Belfer and Jill Grundland scored 0.75 masterpoints with a 51.23% game at Bridge On Shea. See full results of this game. Sudhakar Divakaruni and Dena Goldston scored 0.74 masterpoints with a 56.25% game at Bridge On Shea. See full results of this game. Lydia Sweet and Stacey Langerman scored 0.81 masterpoints with a 51.85% game at Bridge On Shea. See full results of this game. John Urciuoli and Dena Goldston scored 0.47 masterpoints with a 56.52% game at Bridge On Shea. See full results of this game. 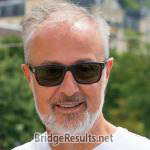 Jerry Gaer and Eva Berlin scored 0.67 masterpoints with a 54.17% game at In Tempo Bridge Club. See full results of this game. Eva Berlin and Monique Greene scored 1.35 masterpoints with a 58.33% game at In Tempo Bridge Club. See full results of this game. George Drake and Sudhakar Divakaruni scored 0.29 masterpoints with a 53.24% game at Bridge On Shea. See full results of this game. Dan Lavine and Jill Grundland scored 0.34 masterpoints with a 48.93% game at Bridge On Shea. See full results of this game. Sheila Horowitch and Lois Tatelman scored 0.63 masterpoints with a 49.04% game at Bridge On Shea. See full results of this game. Lydia Sweet and Helene Drake scored 4.38 masterpoints with a ★62.85%★ game at Bridge On Shea. See full results of this game. Mady Stoll and Lynda Thal scored 0.68 masterpoints with a 48.95% game at Bridge On Shea. See full results of this game. Charlie Kelley and Jill Grundland scored 1.15 masterpoints with a 54.27% game at Bridge On Shea. See full results of this game. Eva Berlin and Jerry Gaer scored 3.00 masterpoints with a 58.33% game at In Tempo Bridge Club. See full results of this game.